Despite being on the homeward leg today showed that the Mera Peak trip is definitely not over. 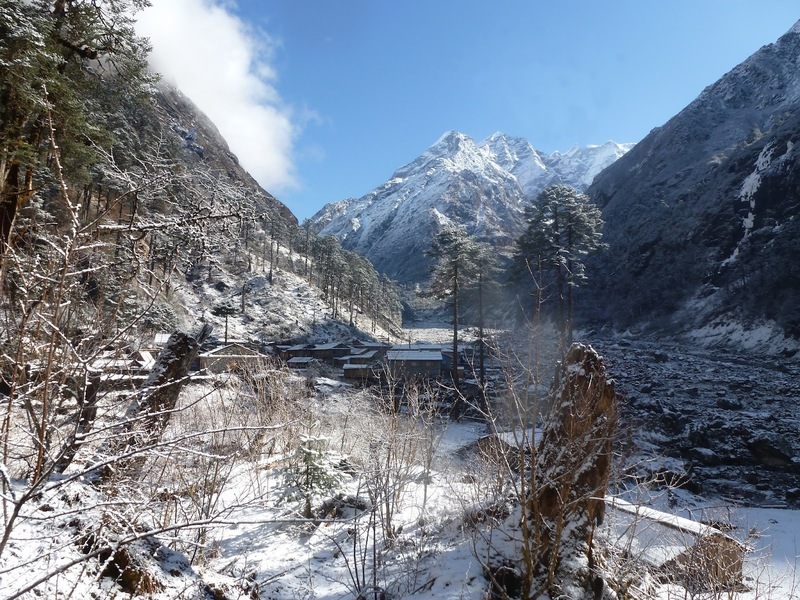 To get from Koto to Lukla and the flight to Kathmandu we have to cross the Zatrwa La Pass over the Charpate Himal. It's a 4,600 metre pass and is covered with the same snow which gave us the storm we experienced at High Camp last Friday. It's a three day trip. 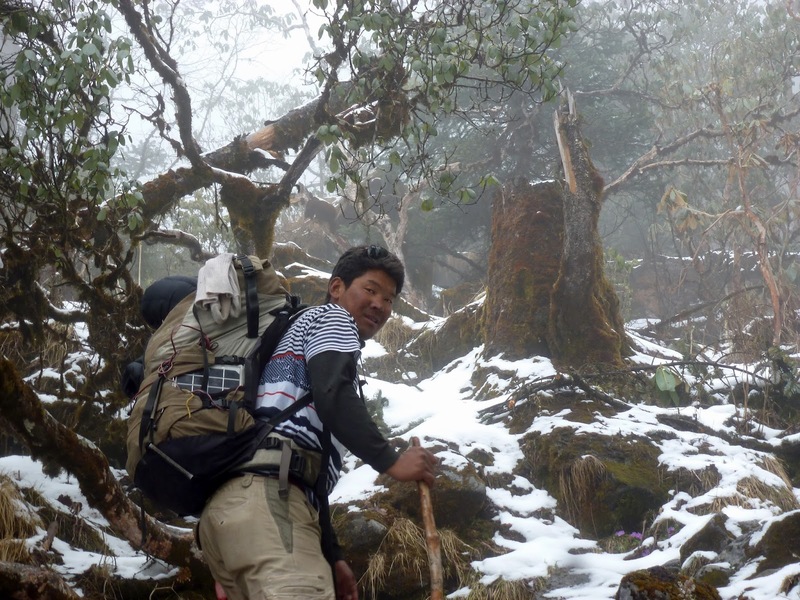 On the first day out of Kote we climb up to Thuli Kharka and spend another night camping high, at 4,300 at Thuli Kharka. 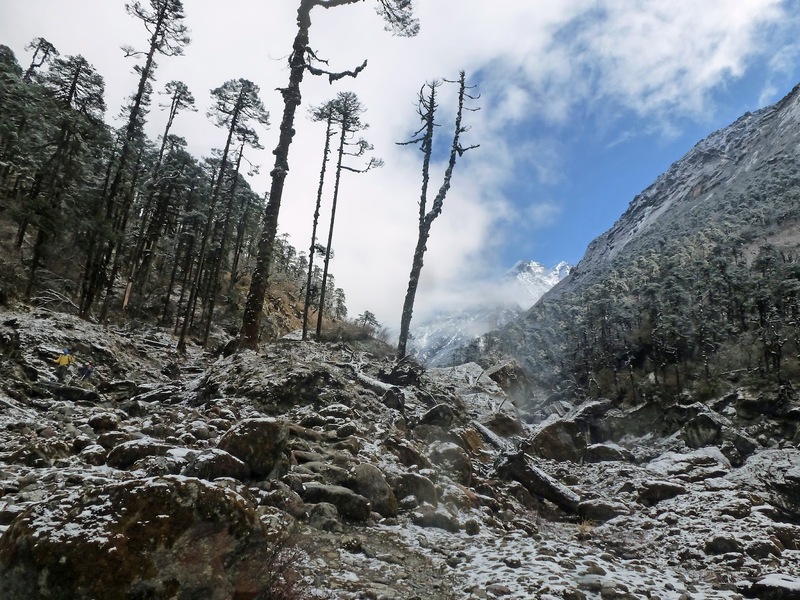 On the next day we cross the pass and head down to Chutanga for the last night in tents before a short walk the next day into Lukla. The weather has been the classic combination of morning sunshine and afternoon cloud. To be honest I can do without the sun, my face is badly sunburnt and my lips in particular are in a terrible mess. With fresh snow from the night before the first part of the walk was wonderful. Idyllic views up the valley to Kote with a final glimpse of Mera Peak beyond. The trees looked amazing. The Himalayan Pine are old and gnarled and the moss growing on them so thick that it resembled some sort of clinging animal, a kuala bear perhaps. The rhododendrons and the primulas through the gaps in the snow added some colour. After going up and down along the side of the valley we at last turned inland and started to climb properly. The path was steep and slippery and it was hard to keep your feet. Lunch was at a tea house half way up and the shelter was welcome because by now it had started to rain. In the rain and the mist the walk after lunch became a challenge. Climbing steady we eventually arrived at a mini pass which and on a fine day would have provided some views particularly as we were now well above tree line. As it was all we could see ahead of us was a narrow snow laden path and an apparent steep drop into mist. The guides were getting nervous and started to watch every step we took. At one point we were being guided individually with instructions on where to place each foot. It took a long time and when we got to the next pass the guides were visibly relieved that we had completed this bit of the walk - perhaps the mist hidden from us the full extent of drop. 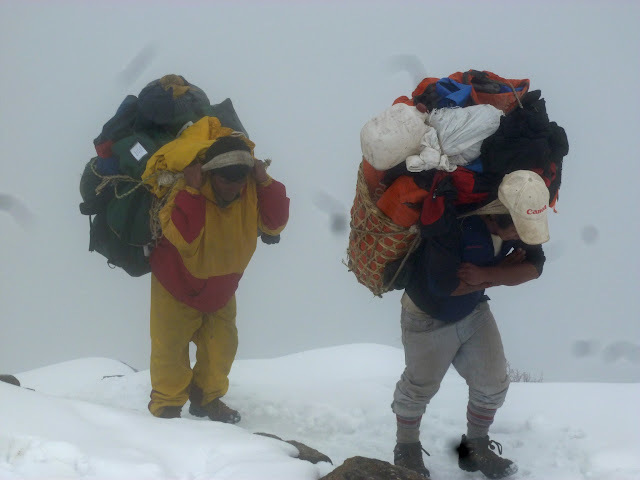 Meanwhile of course the porters were making their way along the same paths but with huge loads on their backs. The loads by the way have got bigger as they are now carrying the climbing gear which has been taken up to Tangnat separately but was now coming down with us. The porters are typically very short, five foot three to five inches tall, and with load on their backs they walk with a pronounced stoop. On the steeper parts of the trail, you kept coming across the marks made by them in the snow as they thrust their hands down to keep their balance. By the time we got to Thuli Kharka the mist had cleared a bit but the camp still felt cold and miserable. Still the stove in the tea house was soon belting out its heat, powered by wood carried up the mountain, and the phrase, so often repeated that it's almost a chant, "shut the door" was echoeing across the valley. On any hike or trek, the sun can really turn out to be a pain. Then again, I ask myself if I'd rather be sunburned or frozen.